CMoN Contest 30 - Wrath of Kings CMoN Contest 29: All the Shades of Grey CMoN Contest 28 - Dark Age Games: A Dark New Year CMON Contest 27 - Rivet Wars Painting Competition! CMON Contest 26 - Dark Age Games Blood Bath Painting Competition! THQ Space Marine Painting Competition! CMON Contest 25 - AUSCON Steampunk Dorothy CMON Contest 24 - Bonnie Ann from Kabuki Models CMON Contest 23 - Kisa and Scratch from Soda Pop Miniatures CMON Contest 22 - Classic Female Barbarian from Dark Sword Miniatures Kublacon People's Choice Award 2010 CMON Contest 21 - Ayu Beat from Soda Pop Miniatures CMON Contest 20 - Sad Panda from Dark Sword Miniatures CMON Contest 19 - Khaine-D'Lacreu from Anima Tactics Miniatures CMON Contest 18 - Candy & Cola from Soda Pop Miniatures CMON Contest 17 - Kingha the Amazon from Enigma Miniatures CMON Contest 16 - Lich King from Mad Puppet Miniatures CMON Contest 15 - Female Anti-Paladin from Dark Sword Miniatures CMON Contest 14 - Akkazu from Enigma Miniatures CMON Contest 13 - Sihoban Nightshade from Dragon Blood Miniatures CMON Contest 12 - Female Sorceress from Dark Sword Miniatures CMON Contest 11 - Celia from Anima Tactics Miniatures CMON Contest 10 - Lily, Witchomancer CMON Contest 9 - Dark Crusader CMON Contest 8 - Dark Age Saint Johann CMON Contest 7 - Dark Age Lilith CMON Contest 6 - Alejandra CMON Contest 5 Mini - Sporkqueen CMON 4 contest - Female Mantis Assassin 3rd CoolMiniOrNot Painting Contest! 2nd CoolMiniOrNot Painting Contest! 1st CoolMiniOrNot Painting Contest! First place, with $150 in CMoN store credit, goes to "Union Worker" by TIPHARET. Second place, with $100 in CMoN store credit, goes to "The Ironward" by Benjamin Williams. Third place, with $50 in CMoN store credit, goes to "Alyena Heska" by BangDoll. 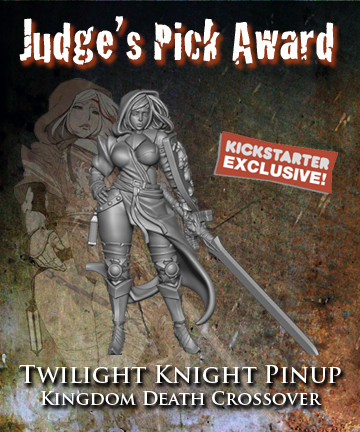 Our special Judges' Pick Award, and the limited edition Twilight Knight, goes to "Gutter Friar" by chard289. Thank you all for entering! We love this game, and we love seeing what all of you bring to it with your work. Keep an eye out for our next online painting contest announcement later this month! Wrath of Kings has hit retail shelves, and players are posting up their shiny new armies on social media. 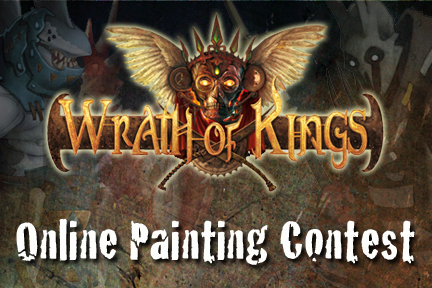 We think it's time for an official Wrath of Kings painting competition! Here's a great chance to show off your nifty leader conversion, or an interestingly based unit. Maybe a vignette of your favorite characters from the story? We want to see your creativity and skills at work on this very fun range of models. This competition begins Friday, April 10, 2015. Submissions will be accepted through Saturday, May 23, 2015. Winners will be announced on Monday, June 1. • You must be a registered CMoN user. Registration is free and there is no entry fee. You can set up an account here. • Upload one photo per entry to your user gallery. Photos may be composites or collages to show multiple views of the mini. • All entries must be uploaded to CMoN. No external links are accepted. • Entries may be single figures, monsters, units, or dioramas. • Focal miniatures (not terrain or accessory items) must be from the Wrath of Kings range. This includes plastic game models, limited edition resin models, and Wrath of Kings related Kickstarter exclusive models. Models may be stock or converted. • Entry photos must not have appeared in CMoN user galleries prior to the beginning date of this contest. You may submit new photos of previously painted models. • Each user may submit up to 3 entries. • The user gallery must be created, and the photographs uploaded, by the person who painted the entry. • Entries must be uploaded before midnight EST on Saturday, May 23, 2015. • Winners will be determined by CMoN user voting. Each entry will be ranked on a scale of 1 to 10. • Each user may vote on each entry only once. Subsequent votes from the same user account will not be factored into the final score. • Only registered CMoN users may vote. Votes from unregistered users will not be factored into the final score. • Voting will open Sunday, May 24, and close at midnight EST on Saturday, May 30. • The three highest scored entries will be awarded first, second, and third place. Please note, while you may submit up to 3 entries, you are only eligible for one place award. Your highest scoring entry will receive the prize, and the next ranked place will go to the next highest scoring entry from another entrant. • First place will receive $150 in CoolMiniOrNot store merchandise credit. • Second place will receive $100 in CoolMiniOrNot store merchandise credit. • Third place will receive $50 in CoolMiniOrNot store merchandise credit. • Additionally, a special ‘Judges’ Pick’ award will be chosen by CMON studio painter Jen Haley and Wrath of Kings designer and developer Michael Shinall (CMoN's Mr. Black). The winner will receive a copy of the very rare Kickstarter exclusive, the Wrath of Kings/Kingdom Death crossover Twilight Knight. All entries are eligible for this award. Good luck, and happy painting! How to make a cheap yet effective spray booth. How to paint RED, with ease!